The public is invited to Hawai‘i County’s Magic of the Season Open House that will be held 5:30 p.m. to 8 p.m. Monday, December 12, through Friday, December 16, at the Hawai‘i County Building in Hilo. County volunteers will provide refreshments and light pupu, offer holiday activities, and spread cheer so families may enjoy a safe, community-oriented event. Nā Hōkū Hanohano award-winning performers Mark Yamanaka and Darlene Ahuna will be joined by the Hawai‘i County Band, hula dancers and other exciting performers. The Magic of the Season also features dozens of trees that County employees have decorated. Members of the public are encouraged to stop by the County Building, located at 25 Aupuni Street in Hilo, weekdays from at 8 a.m. to enjoy the festive trees. All activities and entertainment are free. The council members generally recognized there is a need to restrict any further introduction of the GMOs here on our island offering suggestions to address those concerns. Given the current presence of some genetically modified crops here, the challenge is to move forward in a manner that is pono and minimize the impact on those adversely affected by any restrictions. Bill 79 was cumbersome with layers of amendments. For this reason, I withdrew the bill in order to submit a clean, simpler version. This “withdrawal” was simply a good procedural move, and should not be interpreted as any less resolve on my part to meaningful legislation. One suggestion being considered is whether to set up a council ad hoc committee (comprised of up to 4 members of the council) to address related issues and how best to implement and enforce legislation. I submitted this possible format for this ad hoc committee at the August 6th council meeting in Communication. 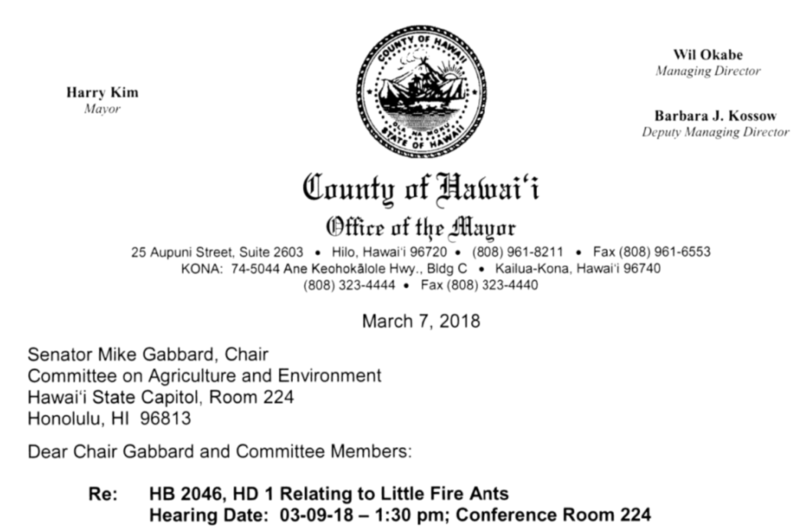 Home rule issue: If Hawaii County residents want to limit the spread of GMO crops and plants on this island, we need to have an ordinance in place before the end of the year. Otherwise, we can expect the biotech companies to seek and easily lobby for passage of legislation prohibiting any county level laws that may interfere with the biotech corporate agendas (During this last legislative session, Monsanto and associates sought to pass SB727 which would have gutted county government). For this reason any effort to postpone passage of a bill restricting GMOs beyond December 2013 is tantamount to killing the bill. Thank you. I do want to thank all who have submitted written or oral testimony. Just this past week I finally received all written testimony to the council for the July 2nd hearing and I have read through almost all of the 1000+ letters in support of Bill 79, and the approximate 100 opposition letters. Prior to the August 6th hearing we again heard from many, both in support and in opposition and I have also read through this wave of emails as well. The next GMO hearing on my successor version to Bill 79 is expected to be scheduled in Hilo for September 6th at 9:00 a.m.
July 1, 2013 is the due date for exemption applications for the Homeowner’s, Homes of Totally Disabled Veterans, Properties of Persons Affected by Hansen’s Disease and Properties of Persons who are Blind, Deaf and/or Totally Disabled programs. If you feel that any of these programs apply to you, applications must be submitted by that July 1, 2013 deadline for the Homeowner Exemption to be effective January 1, 2014 while all the other programs mentioned are effective immediately. If you are already enrolled in these programs you need not apply again as they renew automatically. However, if your address, personal status or other qualifying circumstance changes you must inform us in 30 days after that change as these are personal exemptions and do not run with the parcel they are applied to. You may visit our Real Property Tax Offices in Hilo or Kona, or access the website at www.hawaiipropertytax.com to download an application or for further information. Gov. Neil Abercrombie will be traveling to Kailua-Kona tomorrow, May 28 to honor Older Americans Month Hawaii County awardee Peter Hoffmann in a ceremony and reception at the County Council Chambers in the West Hawaii Civic Center. Every year, eight kupuna ‒ one male and one female from each county ‒ are selected as Older American volunteer honorees for the exemplary work they do to aid and support their individual communities. The female honoree for Hawaii County, Shirley Ito of Hilo, will be meeting with the Governor at a later date in Hilo in recognition of her volunteer work. Hoffman, who is from Waikoloa, was nominated for this award by the Waikoloa Senior Center. He organized the local senior center and was the founding and continuing president through mid-2006. He presided over the monthly meetings, drove the van on monthly outings, arranged for speakers, and took charge of most of the activities. He was the sweat equity of the senior center. At the youthful age of 72, Hoffman has committed his time and energy to numerous other community programs including the School Supply Drive, the Waikoloa Village Association, the Waikoloa Community Development Corporation, and the 21st Century Learning Center out of the Waikoloa Elementary School. Additionally, he serves as cantor at the Puako Ascension Catholic Church where he was named Island Treasure by the Diocese two years ago. Wes Lum, director of the Executive Office on Aging, and Alan Parker of the Hawaii County Office on Aging will be joining Gov. Abercrombie in the celebration honoring Hoffmann. After proclaiming May as “Older Americans Month” in Hawaii on May 3, the Governor recognized honorees from Honolulu, Betty Goya and John McGuire, and Kauai County, Dr. Lucy Miller and William Neil Rapozo, Sr. at events on their respective islands. Honorees from Maui County, Diane Logsdon and Richard Endsley, will be meeting with the Governor in a ceremony on Maui in July. This year’s Older Americans Month theme –“Unleash the Power of Age” –emphasizes the important role of our kupuna. Seniors across the nation are being recognized as productive, active, and influential members of society. For more information and to find ongoing opportunities to celebrate and support older Americans, contact the Executive Office on Aging at (808) 586-0100 or local Area Agency on Aging by visiting the Aging and Disability Resource Center at www.hawaiiadrc.orgor (808) 643-2372. I want to thank everyone who supported my position in objecting to the process used to create and pass House Bill 252. Please know that all the emails and calls that each senator received were crucial to the approval of the important amendment I proposed this morning. Without your public comments, this may not have happened. I remain concerned that due process, including public comment, was by-passed, yet as the process was going forward regardless, including a major improvement was the best course of action to take. I object strongly to the process that introduced geothermal permitting procedures into an unrelated bill, HB252, without public notice of the changes or opportunity to testify. While the bill has some desirable provisions, the lack of transparency is difficult to support. The procedures used to by-pass public input are potentially unconstitutional, as is the fact that HB252 now contains two unrelated subjects. It is unfortunate this kind of politics persists in our State legislature. Earlier in the session we had two bills on this issue, HB106 and HB932. HB106, which restored County oversight and contested case hearings, was supported by Hawaii County Council, OHA, Puna community groups, and 90% of testifiers. HB106, which had the support of the majority of the subject matter committees, was deferred, probably in hopes of passing HB932 instead, yet HB932 did not have support in committee. HB932does restore county oversight, but replaced contested case hearings with forced mediation and made changes to the definition of geothermal. It was opposed by all community groups and individuals, yet supported by Hawaii County Mayor and DLNR. The last minute language inserted in HB252 is similar to HB932. Inserting this language, from the bill with the least support, thwarts the desires of the impacted community, the Hawaii County Council, and OHA. The voice of the community was ignored by this objectionable procedure. This continues a long-standing trend that has resulted in the problems and controversy we now have over poorly planned geothermal development. Instead of voting “no,” in what appeared to be a losing battle to kill the bill, I submitted an amendment to improve HB252. My amendment removes the requirement for mediation from this bill. As senator of the only district with geothermal development, I am aware of some of the problems that result from poorly regulated planning. Required mediation processes proved profoundly unsuccessful in 1990. The agreements reached in mediation were violated, and the enforced mediation process is widely reviled by the community. The affected communities deserve the right to contested case hearings, as is the common remedial action in most planning disputes. By removing references to mediation, citizens’ rights are protected, and one of the most objectionable portions of HB252 is corrected. My community and I support safe geothermal development. We simply desire fair treatment and due process to ensure a safe community. Given that the amendment was approved; I can now support this bill instead of opposing it, since it does provide for the reinstatement of county oversight that was taken away in Act 97. Again, I want to thank everyone who submitted comments and will continue to remain vigilant when similar tactics are applied to legislation that could negatively affect my district and the State. You provided a voice that was heard loud & clear! No new testimony is needed at this time. The Hawaii County Council is having a public hearing on Bill No. 292 which would restrict geothermal exploratory and production drilling to the hours of 7 a.m. to 7 p.m. The public will be allowed up to 3-minutes to provide testimony. The public hearing is on Friday, November 2, 2012 at 5:30 pm in the Pāhoa Neighborhood Facility. For more information, please call Chairman Yagong at 961-8538. On October 15th 22,200 absentee mail ballots were sent to Hawaii County voters. As of October 29th, Hawaii County has received 14,584 voted absentee mail ballots. New requests are processed and absentee mail ballots are sent to Hawaii County voters on a daily basis. Hawaii County voters are advised that the deadline to submit an application for an absentee mail ballot is October 30, 2012 at 4:30 p.m. Applications for an absentee mail ballot that are received after this date will not be processed for the 2012 General Election. On October 23rd, Hawaii County opened absentee/early walk-in voting precincts in Hilo , Waimea and in Kona. Absentee/early walk-in voting is open to all registered voters at any early walk-in voting precinct on the island, regardless of district or residency assignment. Absentee/early walk-in voting will continue until November 3, 2012. As of October 29th, 4,688 Hawaii County voters have voted absentee/early walk-in voting in Hawaii County . For more information please contact Lehua Iopa, Acting Elections Program Administrator, Hawaii County Elections Division (808) 961-8277 or by electronic mail to eiopa@co.hawaii.hi.us. Children of all ages look forward to Halloween but police want to keep them safe to enjoy the fun. According to the Centers for Disease Control and Prevention, roughly four times as many children ages 5-14, are killed while walking on Halloween evening than other times of the year. Sergeant Robert P. Pauole, head of the Hawaiʻi Police Department’s Traffic Services Section, pointed out that drugs, alcohol or both have been factors in at least 63 percent of the 35 traffic fatalities we’ve experienced so far this year. He urges all motorists to be extra cautious in the next few days, when a large number of pedestrians may be out for Halloween festivities. -Drive below the posted speed limit during trick-or-treating hours. -Watch for keiki darting out from between parked cars. -Enter and exit driveways and alleys carefully. -Accompany your keiki when they go trick-or-treating or make sure they are supervised by a responsible adult. -Have your keiki trick-or-treat in a safe location (consider a local mall or community event). -Make sure keiki are supervised as they cross the street. -Have keiki get out of cars on the curb side, not on the traffic side. -Carry flashlights and use reflective tape or stickers on bags and costumes for keiki to see and be seen. -Avoid masks or costumes that limit a keiki’s vision or movement. -Check all treats before letting your keiki eat them. Well as everyone knows by now we had a big scare again with a Tsunami Warning that happened following a 7.7 magnitude earthquake off the British Columbia coastline. I was following the story fairly closely but was pretty concerned because the Civil Defense Sirens were not going off and nothing was being reported on the Civil Defense Page about the possible incoming tsunami. The Pacific Tsunami Warning Center has cancelled the tsunami advisory for the Island of Hawaii, however small sea level changes and strong or unusual currents may persist for several additional hours. Beaches will remain closed until further notice. This will be the final message issued for this event unless conditions change. I first learned about it at 7:15 pm Hawaii time and didn’t even hear the first siren in Pahoa until nearly 9:15 in the evening! I know that the sirens were going off in Kona earlier as my wife was staying at the Keauhou Resort for a soccer tournament and they got evacuated as soon as the sirens went off over there around 8:30. I was getting facebook reports from other parts of the island that they weren’t hearing sirens either. Big Island Video News posted a video of the strange tidal action that was happening shortly after the tsunami hit and you can view that here “Video: Tsunami Brings Strange Tides to Wailoa Boat Harbor“. On October 15th 22,200 absentee mail ballots were sent to Hawaii County voters. Between October 15th and October 24th roughly 460 new requests for absentee mail ballots were received by Hawaii County. The new requests are processed and absentee mail ballots are sent to Hawaii County voters on a daily basis. As of October 24th, Hawaii County has received 8,341 voted absentee mail ballots. On October 23rd, Hawaii County opened absentee/early walk-in voting precincts in Hilo, Waimea and in Kona. Absentee/early walk-in voting is open to all registered voters at any early walk-in voting precinct on the island, regardless of district or residency assignment. Absentee/early walk-in voting will continue until November 3, 2012. As of October 24th, 1,703 Hawaii County voters have voted absentee/early walk-in voting in Hawaii County. The Hawaii County Elections Division is seeking kids’ art and essays – lots of it! We hope to encourage students and educators to learn about and get interested in elections. Art and essays may be turned into legislative branch offices in Hilo , Waimea, Kona and Pahoa. Essays may also be e-mailed to our offices to jbennett@co.hawaii.hi.us. The Art contest is for kids ages 8-10. Design the voting machine of the future! Artwork should be about the voting machine that can be used to cast votes in the election of the future. We are looking for drawings, paintings, sculpture, collage, mixed media, all formats are welcome. An overall winner will be chosen from all of the entries. Deadline for submission is November 5, 2012 at 4:30 p.m. Winners will be announced on November 11, 2012. The Essay contest is for kids ages 11-13. In 800 words or less, each student should use their imagination and write about what they would accomplish if they were a candidate for the Hawaii County Council and elected to a two-year term to the Hawaii County Council on November 6, 2012 (General Election). An overall winner will be chosen from all of the entries. Deadline for submission is November 5, 2012 at 4:30 p.m. Winners will be announced on November 11, 2012. All submissions must be submitted with the name and age of the participant and the parent/legal guardian’s name, mailing address, electronic mail address and telephone number. For more information please contact Judy Bennett, Temporary Elections Clerk, Hawaii County Elections Division (808) 961-8277 or by electronic mail to jbennett@co.hawaii.hi.us. The Hawai’i County Food Self-Sufficiency Baseline study received a 2012 Planning Award from the American Planning Association, Hawai’i Chapter at the recent Hawai’i Congress of Planning Officials annual conference in Honolulu. The Hawai‘i Island Food Self-Sufficiency Scorecard shows the percentages of locally produced food consumed in 2012, part of the award-winning Food Self-Sufficiency Baseline Study. The report was produced for the Department of Research and Development by the University of Hawai’i Geography Department and Jeffrey Melrose of Island Planning. The award was given in the category of Innovations for Sustaining Places. The Baseline study was a recommendation of the Hawai’i County Agricultural Development Plan that was adopted in 2010. It provided a summary of the current state of local food production and import data for Hawai’i County. The baseline study also produced detailed maps of existing agricultural activity on the island as a way to measure current farm activity, and to distinguish the unique circumstances that drive farming in each region around the island. The report also provided a list of 100 Things to Do to Increase Food Self-Sufficiency on the island. This list emphasizes the need for everyone, from consumers and government to farmers and retailers to be involved in the process for increasing food self reliance. A link to the Study and many of its maps and graphics is available on the web at HawaiiCounty.gov under the Announcement section. The Office of the Hawaii County Clerk has received media inquiries concerning the elections workshops organized by the State Office of Elections. The State Office of Elections workshop schedule is as follows: (1) September 10, 2012 – Kauai; (2) September 27, 2012 – Maui; and (3) October 4, 2012 – Oahu. The media has questions concerning the reason why the Hawaii County Clerk did not attend the September 10, 2012 training on Kauai. When Will Hawaii Save Taxpayer Money and Quit Putting Paid Public Notices in Newspapers? I’d love to know how much Hawaii County is wasting on public and legal notices printed in the newspapers that are REQUIRED to be be posted in the newspapers. There is an organization called Legal Notice Online that has been monitoring the policies of different states laws regarding legal and public notices and today they sent out the following. Simply put… the State and the County could save lots of money by putting these notices online, they could reach a larger audience in a more timely basis, they could save a lot of paper waste, and they could control any changes in the notice if need be at any time? Competition In The Legal Notice World? We Hope So. A new non-profit trade group- The Local Independent Online News Publishers (LION) was formed this month, it has been reported. Over 100 of these publishers, according to CJR.org will gather at the Block by Block conference next month in Chicago. How Does This Effect The World of Legal Notices? We’ve discussed the emerging influence of the hyperlocal news sites when they’ve made noise in specific public notice legislative battles over the past year. In most instances, though the local publisher has acted on his or own. So far, better organized Press Associations have defeated the online publishers, often with professional lobbyists and legislative arm twisting. As a group, maybe LION will allow these hyperlocal sites to help each other in moving public opinion. LION has stated neither on their Facebook page nor on their web site that they intend to try to be considered as newspapers of record for the lucrative publishing of legal notices in their local communities. We think it is a worthy endeavor and is consistent with several of their values and strategic goals. More than that, competition in that world would save all taxpayers money. According to LION’s web site, The Patterson Foundation provided support for the initial organizational effort. Dylan Smith, publisher of the TucsonSentinel.com and former online editor of the Tucson Citizen is the organization’s chairman. The emergence of this type of organization is a great story for all media. Smith sees this organization as the future and we hope he’s right. From the ashes of the burning of the unwieldy corporate, profit motivated journalistic behemoths rises grass roots journalism organizations that are in touch with their readers and are the watchdogs of their communities. The Office of Elections has received numerous requests to investigate what transpired during the 2012 Primary Election in the County of Hawaii from public officials, candidates, and members of the public. In order to best address those requests, we believed it appropriate to issue the following report for public dissemination. In order to understand what occurred in the County of Hawaii, it necessary to first reiterate, as we have told people in the past, the different roles and responsibilities of the State and the counties when it comes to elections. As provided for in the Hawaii State Constitution, my duties include the supervision of state elections. Article IV, Section 3. In regards to county elections those are within the purview of each county. As provided for in the County of Hawaii’s charter, “[t]he council shall appoint the county clerk” and the county clerk shall “[c]onduct all elections held within the county.” Section 3-6(b). The County of Hawaii, similar to the other counties, provides in its charter that its elections will be held in conjunction with the Primary and General Election. Section 13- 27. As such, the Office of Elections attempts to work in coordination with the county clerks in running our combined elections, while recognizing the autonomy of each county. Article VIII, Section 2 (Local Self-Government; Charter). In county only elections, the county is responsible for all aspects of an election ranging from voter registration, polling places, absentee voting, operation of the voting system, counting of the ballots and reporting of the results. Similarly in state elections, the State is responsible for all aspects of the elections. HRS §§ 11-182 and 11-183. In combined state/county elections, the counties are responsible for voter registration and absentee voting. HRS §§ 11-11 and 15-4. Those responsibilities are always the statutory province of the counties. Additionally, the counties are responsible for storage of election materials. The State in combined elections is responsible for operating election day polling places and in operating the voting system including the counting of ballots and reporting of results. There are various other subsidiary responsibilities that the counties and the State split in an equitable manner. HRS § 11- 184.
worked to the benefit of the voters. It is our assumption that the county clerks factor this into justifying their personnel descriptions for their civil service positions, staffing allocations, and in requesting budget appropriations from their county councils for elections. The County of Hawaii has never refused this delegation of responsibility or the compensation from the State and it has always said it was up to the task, even when it terminated its civil service election administrator in an election year. Instead, at all times, the County Clerk has contended that she was up to the task and that there were no problems. The State in reviewing the matter has spoken to the County Clerk several times and corresponded with her about the county’s readiness for the elections. At all times, the County Clerk had said she was prepared. The Hawaii State Elections Commission dedicated a portion of its May 30, 2012 meeting to discuss with the county clerk whether she was prepared for the 2012 elections, given correspondence it had received from Councilmember Dennis Onishi. The County Clerk insisted that everything was under control. Attached is a copy of the draft minutes from that meeting. During the meeting, the Elections Commission sought for the County Council to provide additional assurances that the elections would be successful in the County of Hawaii. Commissioner Orikasa asked Councilman Onishi how the Clerk is selected and Onishi responded that Clerk is appointed by the Council Chair. Commissioner Orikasa then asked what opportunities are available for the Council to get involved with getting assurances that the elections will be successful. Councilman Onishi responded that he could make a request to the Council Chair that the elections topic be placed on the agenda for the next Council meeting. He also explained that since the election time frame is so short, he wrote to the OE and the Elections Commission to see if he could get the status on the Hawaii County elections. Commissioner Orikasa then suggested that Councilman Onishi go ahead and try to have the elections topic placed on the agenda. Onishi said that he would ask the Chair to place the topic on the next meetings agenda. Councilman Onishi also stated that his intent for going to the OE and the Elections Commission was to protect the people of Hawaii County and make sure that they have a fair and open election. regarding elections. He also wanted to comment that the elections are a cooperative effort that involves all parties and he also encourages County Clerk Kawauchi to get whatever resources necessary to succeed in this election. Councilman Onishi suggested that if available, the Commissioners could attend the next Council meeting. Commissioners Okazaki and Masunaga said that they would be willing to attend the meeting if elections were placed on the agenda. Councilman Onishi also expressed that he is appreciative that this issue was placed on this Commission meeting agenda for discussion. Elections Commission Meeting Minutes (Draft) at pages 7 and 8. Ultimately, it is our understanding that the County Council never elected to put the issue on their agenda. As such, we had to continue to legally rely on the representations of its county clerk who by charter “[c]onduct all elections held within the county.” Section 3-6(b). In other words, it is our understanding that no one other than the County Clerk, or perhaps the County Council that appoints her, has legal authority to speak on behalf of the County of Hawaii in regards to election matters. We are fielding calls as to what is going in your county, as well as, when your absentee ballots are going to be mailed out. Your closure on July 23, 2012, and your failure to thoroughly communicate to the rest of the election community and the media as to the reasons for the closure, has unnecessarily lead to significant speculation in the public about the integrity of our elections only a few weeks before the August 11, 2012, Primary Election. This is simply unacceptable on the part of a fellow election administrator. The public relies on us to be assured that their elections are safe and secure. Excerpt of Letter to County Clerk (July 25, 2012). Ultimately, the County Clerk explained that her “audit” had found some duplicate voter registrations and that possibly a handful of voters may have voted twice. The County Clerk’s lack of familiarity with voter registration and absentee voting records, which are the jurisdiction of the county clerks, apparently lead to her inability to definitively say what she had found. she needed to communicate with the Office of Elections and the other county clerks, and that she would benefit from the institutional knowledge and election administration experience of these election administrators. As we approached the Primary Election, on August 11, 2012, despite the representations by the County Clerk that everything was fine, I felt it important to send one of my veteran section heads to help trouble shoot any problems that might occur, as we had a new counting center manager. Additionally, I requested the Department of the Attorney General to assign a deputy attorney general to the Board of Registration that would be based in the County of Hawaii for the election. What my staff witnessed was poor planning, implementation, and leadership by the County Clerk. Despite this, the hard working staff and volunteers did their best under the circumstances and were able to get through the election. Essentially, the County Clerk on election day is supposed to be like a field general with a plan of attack, who acts confidently, and has the support of his or her troops. The County Clerk was in no way, shape, or form that type of leader. For example, the issue regarding the late opening of polls. While irregularities may happen on election day, as we are dealing with hundreds of stipended volunteers, and many moving parts, the County Clerk lacked the ability to definitively articulate the nature of the problem to the Office of Elections or the public. This resulted in the need for the Governor to conduct triage, in the form of an emergency proclamation, extending polling place hours, based on the limited information that she provided the Attorney General. Specifically, the County Clerk at no specific time had a handle on how many polling places out of the forty in the county opened late. The election proclamation issued by the Governor refers to over half of the polling places in the County of Hawaii had not opened on time. The County Clerk initially reported three precincts had opened late, later on we were told by the Attorney General’s Office that they had been told twenty five by the County Clerk, and then later in the day we were told by the County Clerk that there were at least eleven but that she was still looking into it. The public’s confidence in our elections was rocked by this election proclamation, which normally is only issued when a natural disaster or emergency occurs. The Governor did not lightly issue this proclamation and under the circumstances, he arguably had no other choice than to protect the rights of the voters, if the County Clerk’s general representations to Attorney General were correct. what the scope of the problem was. We heard nothing on Sunday or Monday from her regarding any further details. A statewide meeting, in Hilo, was scheduled for August 14, 2012 (Tuesday) with all the county clerks to debrief about the Primary Election. During the meeting, the County Clerk still could not answer the question of how many polls had opened late. Additionally, she had no answers to why there had been problems with delivering supplies in West Hawaii to the polling places on election day. Her answers were essentially that she was still looking into it. In the end, we did not get the responses we expected from a county clerk, who had been entrusted with elections within her county. Having said that, given that the public is asking and the fact that we needed to know what the scope of the opening of polls problem was, we immediately conducted our own investigation. Specifically, we took custody of the record books for all forty polling places in the County of Hawaii. We also, immediately began calling every precinct chairperson in the County of Hawaii to get answers, with calls being made that evening and the following morning. The result of that investigation, which was completed the following morning, after reviewing the records books and the notes from the telephone calls, was that a total of thirteen polling places out of forty polling places opened late. However, of those thirteen polling places, four opened between 7:01 a.m. and 7:03 a.m., five opened no later 7:30 a.m., two opened no later than 8:00 a.m., and the final two opened at 8:40 a.m. A copy of the spreadsheet showing the exact opening times for each polling place is attached. Our review of what transpired in the County of Hawaii focused on two things. First, was the conduct of the 2012 Primary Election defensible under the law? Second, did the conduct of the County Clerk unnecessarily undermine the public’s confidence in our electoral system? In regards to the first question, our initial review of the matter indicates that the irregularities complained of, while unfortunate, do not rise to the level of changing the election results. Specifically, irregularities must involve sufficient evidence to demonstrate that the irregularities complained of could have caused a difference in the election results. Sufficient evidence requires something more than a “mere fishing expedition undertaken in the hope that in an examination of all the ballots enough might be discovered to change the result.” Brown v. Iaukea, 18 Haw. 131, 133 (1906). Additionally, any challenger would need to show “actual information of mistakes or errors sufficient to change the result.” Funakoshi, 65 Haw. at 316-17 (citing Iaukea, 18 Haw. at 133). Further, a challenge cannot be based on “mere belief or indefinite information.” Akaka, 84 Hawai`i at 388 (citing Kulike v. Fern, 19 Haw. 278, 283 (1909)). the complaint is legally insufficient because, even if its truth were assumed, the result of the election would not be affected.” Akaka, 84 Hawai`i at 388 (internal citations omitted). In the present case, the irregularities complained of do not appear to be legally sufficient to change the election results. As for the question of whether the conduct of the County Clerk unnecessarily undermined the public’s confidence in our electoral system, the answer is unfortunately yes, for the reasons previously noted. This cannot be allowed to happen again. The County Clerk must rededicate herself to mastering election administration or at the very minimum to surround herself with individuals with expertise in election administration. Additionally, the County Clerk must work on learning to communicate effectively and in a timely manner to other members of the election community and to the public as a whole. We look forward to continuing to work with the Office of the County Clerk, so as to learn from the events of the Primary Election, and to ensure a well administered General Election.